Overclocker Upgrades are used to increase a machines operating speed at the cost of higher power demand and energy consumption. Overclocker Upgrades are placed in one of the four right-most upgrade slots in a machine's interface. Each Overclocker Upgrade reduces the operating time to 70% of the previous time but requires 60% more power. These effects stack exponentially. For example, with a machine with 2 Overclocker Upgrades each operation lasts 0.72 = 49% the original time (204% original speed) and requires 1.62 = 256% the original power. Using 8 Overclocker Upgrades will run the machine at over 17 times normal speed and requires 43 times the energy. While building multiple machines makes better use of a limited energy supply, over-clocking allows for reduced space and wiring requirements when time or compact construction are more important or energy is plentiful. The reduced efficiency can be mitigated by combining both approaches: dividing a number of Overclocker Upgrades evenly between multiple machines. An over-clocked machine's speed is limited by its inventory -- typically one stack of items, thus allowing up to 64 operations per tick. However, this would require too many Overclocker Upgrades to be practical. This section is intended to provide some explanation and practical examples for using Overclocker Upgrades. This revision includes the revised power consumption for 1.71. Each IndustrialCraft2 machine has a rated current draw (required EU/t), a time to process the materials and internal EU storage. When calculating the effects of over-clocking, we need to include these factors. The differences on each machine mean that some machines need more or less Overclocker Upgrades to reach peak speed. The main limit to the number of Overclocker Upgrades you can use is the power requirement. To make machines run really fast, you need to feed them with multiple power supplies, big ones. Max speed benefits are obtained with: 28 Overclocker Upgrades for Macerators and Extractors, 25 for Electric Furnaces and 23 for Recyclers;. In each case you're going to need to put in transformer upgrades, use Glass Fibre Cable and storage upgrades. A standard Macerator draws 2 EU/t, takes 15 seconds per grind and stores 1,200 EU. Five Overclocker Upgrades are a great start. 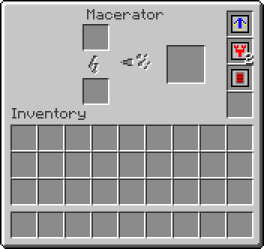 With 5 Overclocker Upgrades,, your Macerator draws 21 EU/t (which can be supplied by a single BatBox) and completes each grind in 2.5 seconds instead of 15! With 8 Overclocker Upgrades, your Macerator draws 85.9 EU/t and completes each operation in 0.9 seconds, just under a second! You can still run this with tin cable but you'll need three BatBoxes in parallel to supply the power. Alternatively, you can put in one Transformer upgrade (which allows 128 EU/t) and use a CESU to power. Use Copper Cable or better! As you put in more Overclocker Upgrades, the power requirements keep going up. 11 Overclocker Upgrades require 352 EU/t which would require 11 BatBoxes or 3 CESUs to drive. My suggestion is to put 3 Transformer upgrades in each machine early, and then upgrade to MFEs and MFSUs any time you're ready. There is a break-point when you reach 13 Overclocker Upgrades in the Macerator, 10 on the Furnace and Extractor and 9 on the Recycler. The energy required per tick exceeds the machine's internal storage. As you approach this limit, you may see the machine flicker or stutter as if your BatBox was running empty. If you put in one more Overclocker Upgrade, the machine will stop entirely. Now you need to add one or more Energy storage upgrades before the machine will continue to function. Maximum speed benefits can be achieved with 28 Overclocker Upgrades in Macerators and Extractors, 25 in Electric Furnaces and 23 in Recyclers. In each case you're going to need to put in transformer upgrades, storage upgrades and use Glass Fibre Cable. The Macerator is the greediest and will need 761 MFSUs to supply the necessary power.